EVERYTHING You Need to Know About The BIGGEST Addiction of Humanity! - THIS is Your Brain On Coffee! EVERYTHING You Need to Know About The BIGGEST Addiction of Humanity! – THIS is Your Brain On Coffee! Do you know that 2.25 billion cups of coffee are drank worldwide every day? That’s 1,562,500 cups per minute or 26,041 cups of coffee every single second. Undoubtedly, coffee is the world’s biggest addiction. It comes from coffee beans which are dried, roasted and ground, and then boiled with water. 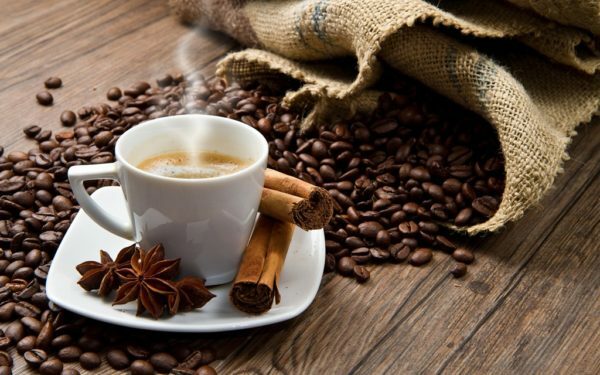 Because it is a product of Nature coffee has many benefits for the human body, like anti-oxidants. However, we drink coffee mostly because of its stimulating effect to keep us awake, focused and filled with energy. But I have news for you! Coffee, doesn’t give you energy at all. It’s all just an illusion that the whole world is fooled by. The trick is done by a substance called CAFFEINE. While we are awake our brain produces another substance called ADENOSINE. This substance is responsible for feeling tired. The adenosine substance binds with adenosine receptors in our brain and we feel tired. While we sleep adenosine levels decrease and we are again ready to start the day fresh filled with energy. 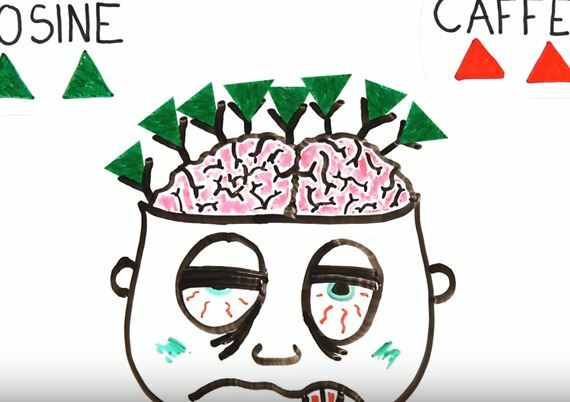 However, caffeine is very similar with adenosine and when it enters our blood stream it gets to our brain and binds with adenosine receptors blocking adenosine of binding with them. This trick of caffeine gives us the illusion that we are not tired, which we mistake for energy boost. All that happens is our brain binds with less sleepy chemicals. 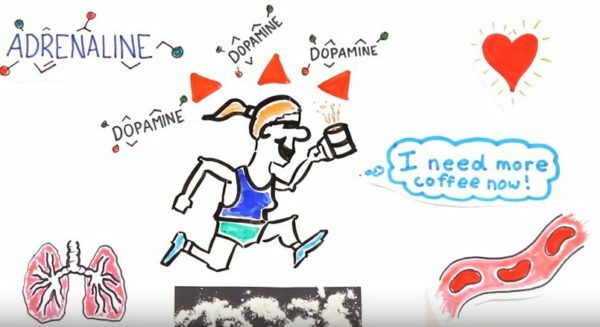 The main thing, however, that makes coffee addictive is the chemical called Dopamine. Caffeine stimulates the brain to produce the neurotransmitter dopamine which elevates our mood. Dopamine also helps create motivation. Another “great” thing about coffee is that it is almost impossible to overdose on it. In theory you can drink as much coffee as you like. You probably wonder if that’s healthy. Many researchers argue about this but all agree on one thing, that in moderate amounts coffee can actually be even healthy and prevent many diseases like Alzheimer’s and depression. 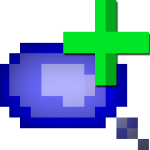 And like we mentioned, coffee has anti-oxidants because it comes from coffee beans. However, because it has a chemical that binds with our tiredness receptors it messes with the balance of our daily energy consumption. Because we don’t actually have more energy, drinking coffee makes our brain create new adenosine receptors to let our bodies know when we need to recharge. That’s why we feel a lot more tired when we don’t drink coffee for a day or 2. There are more adenosine receptors that bind with adenosine chemicals and this gives us the illusion that we are more tired than usual. Coffee also decreases the blood flow in our brain, stimulates production of adrenaline and increases heart rate. When we are abstinent of coffee, and by this time we already have more adenosine receptors in our brain, the blood flow in our brain normalizes and that’s the main reason why many of us coffee drinkers have headaches on days without coffee. But before we come to a conclusion, let’s make things more interesting and dig even deeper on the effects of coffee. 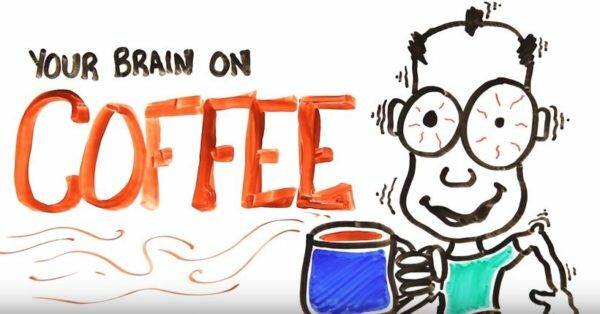 Professor Russell A. Poldrack who specializes in neuroscience and cognitive research at Stanford University in California, recently made a research on the effects coffee has on our neural connections. 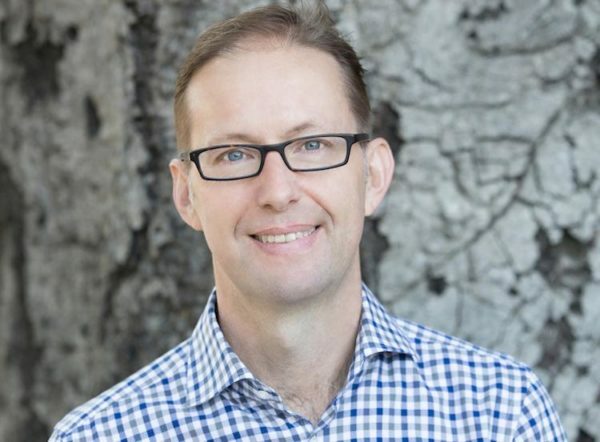 Poldrack scanned his brain function for 10 minutes every Tuesday and Thursday morning – Tuesdays with no breakfast or coffee, Thursdays with – for 18 months. By the visual we come to a conclusion that there is a significant change in the activity and connection of these 5 neural networks. However, the really interesting thing is that the part of our brain responsible for motor skills and visual perception is more active when we are absent of food and caffeine in contrast to when we are fed and caffeinated. This can be due to our primary instinct for survival. When we lack food and energy, in this case the illusion of energy – caffeine, our system activates the survival mode to help us acquire the necessities of survival like food, water, shelter. That’s probably why the areas responsible for motor skills and visual perception are more active when we lack food and caffeine. Also, when we are caffeinated the purple area (CON) responsible for tonic attention comes into play with both the yellow (FPN) area and the black (DFN) area, which are responsible for cognition and stream of consciousness. In other words, we have increased attention on whatever we put our focus to, greater ability of acquiring knowledge and our default network is active which means our brain is staying in a rested state. That’s why when we drink coffee the conversations seem to flow, while writing it’s like the words type themselves (I’m on coffee right now and I cannot stop typing) and executing a certain action seems easier. How much coffee should we drink and when? Taking in consideration everything we spoke of, coffee is one of those things you can learn to use in your benefit. The secret to this is balance, finding just the right amount that is neither too much so that you cannot function without, nor too little so that you feel no benefit at all. Scientists agree that 1 to 3 cups of coffee per day is ideal. I agree with this too as I am consuming 2 – 3 cups of coffee daily. The days I am absent of coffee I do not feel headaches nor I feel more tired than usual. It rarely happens. Coffee gives me focus and awareness, it puts me in that finish-your-task mode and I find it crucial when there is more tasks than usual which need my attention. So, I personally would suggest staying to what the scientists agree upon which is 1 – 3 cups of coffee per day. I would add that coffee is a stimulant which anchors you and gives you awareness of the outer world so it is great for EXECUTION. However, if you want to play with your creativity and come up with some new, creative ideas, coffee does not help. In this case you need something to disengage you from the outer world and let you explore your inner world. Staying free of stimulants like coffee, and simply meditating is perfect for me. In the end we come to a couple of conclusions. Coffee doesn’t give us energy, it only fools us to believe that we are not tired. The biggest reason why we are addicted to coffee is because it stimulates our brain to produce the neurotransmitter Dopamine which motivates us and elevates our mood. Coffee is considered healthy in moderate amounts – 1 to 3 cups per day – it has anti-oxidants and helps prevent Alzheimer’s and depression. However, if you abuse its consumption you may end up feeling more tired, more depressed and with a headache on the days you find yourself without a cup of the “black gold”. The best time to use the benefits of coffee is after 10 am and when you need to take action, finish something or simply focus on EXECUTING a task. If you are smart you’ll use it in your advantage to help you build your dreams into reality.